Today saw just about every expat cyclist I know down here take part in the ‘Roger Pingeon – Heraultaise’, a well-established sportive named after an ex-pro French rider who, presumably, was there today. I was too busy remembering how to pin my bib on my jersey to be bothered, I’m afraid. I didn’t do a very good job of photo taking today, either, mainly because of the world of hurt I was in afterwards. Here are a few from John’s camera to save the day. 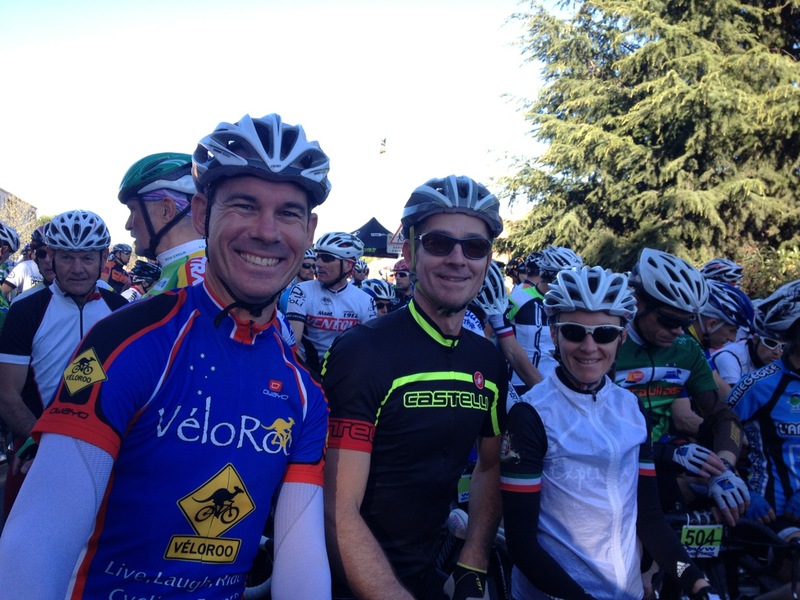 This is Steve ‘VeloRoo’, John and Anne, on a beautiful morning (it got up to at least 25C on the ride) in Le Sud. Note: I know more expats than this. They were just nowhere to be seen. Next, me. I don’t know where that cheesy smile came from, but there are none with no cheese, so it stays. This is a man from Belgium (‘The French part, like Gilbert’) who I thought had more than a passing resemblance to Eddy Merckx. When I told him that we became fast friends. He told me proudly that Eddy and him are the same height and that Eddy is not really Belgian, since he comes from Brussels (‘neutral territory’). He also told me that French must be an easy language because even Belgians can learn it. Belgians even take pot shots at Belgians! I’m liking these people more and more. The race began, as they always seem to – far too fast for my liking. But there’s nothing to do about it; if you don’t go into the red at the start, you’ll be quickly spit out the back for the rest of the day. So we gunned it, me in front and John (I learned a bit later) keeping a close eye on me behind. I think my placing was around 170 out of 400, which I’m pleased with considering my extra baggage (still 71 kg ‘somehow’) and epileptic training this winter/spring. I think I might be able to chalk this up to a) I still have last year in the legs and b) the workouts I’ve been doing with the power meter are more precise that the ‘analog’ heart rate ones of the distant past (before Christmas). My biggest fear today was not having the juice to push through to the end. The longest ride I’d had till today this year was 75 km and the sportive was nearly 140. It hurt a lot, don’t get me wrong, but I finished and even had a cheeky sprint on me at the end. What I want to say is that it’s really true that ‘miles in the legs’, both micro and macro, is really a truism in our sport. Yes, there were a few dicey moments. Yes, not everyone was paying 100% attention 100% of the time. However, the cyclists I rode with today knew how to ride, knew the rules, and treated each other like comrades, instead of enemies. Today was something special because the many riders hiding in the back of my group never even attempted the tried and tested sprint to the line ahead of those who did all the work (granted, this is their right – it’s just dickish). When it’s mid 20s in April, I guess it brings out the best in people. The bunch I ended up with today was good, as I said, but it wasn’t full of strong riders eager to take long pulls at the front. This hampered things a lot, and we spent a good amount of time going slower than we should have. I tried to stay back today (this was the plan, since I didn’t think I’d make the distance otherwise), but I just couldn’t stand it and took my turns at front when it all got too much. I also found myself at the front on the few climbs that we had, which both surprised and depressed me, since whoever I dropped on the ascent, seemed to catch up on the flat afterwards. 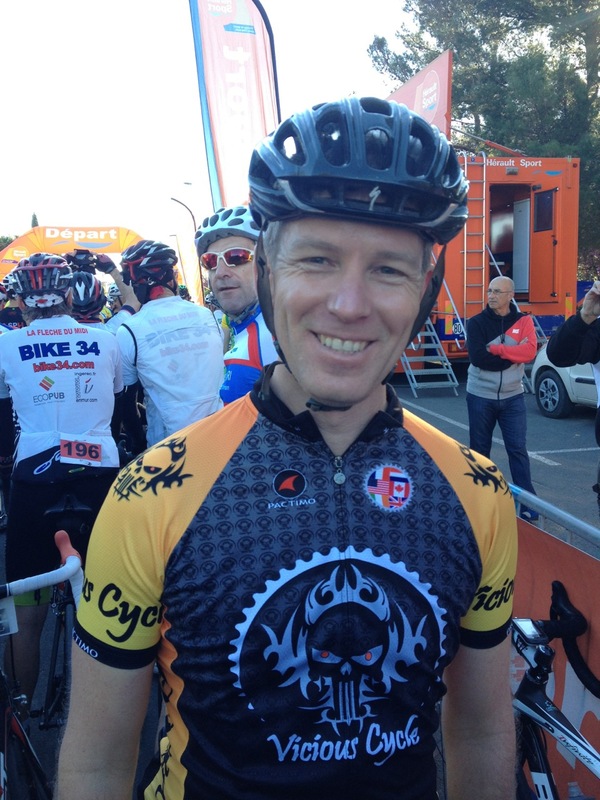 They aren’t up yet, but John finished ahead of me by a minute or so, having lost his group somewhere in the garrigue. Anne was the only woman in her category, so she did pretty well…but also came in somewhere around 230th place overall, which is fantastic (very, very few women today). Our other friends have their own stories, but they’ll have to get their own blogs to talk about it. I need to watch the Tour of Flanders that I missed today. I’ve got tomorrow off, then only 2 days of training before my last knee shot on Wednesday and then nothing till the Saint Tropez Gran Fondo on Sunday. It’s not a lot, but I’m hoping today gave me the jump-start I needed for my ‘spring campaign’. A triumph. I take it that the knee is holding up quite well. Oh, the knee. Yes, it is apparently, because I forgot to even mention it. Those shots are magic. Excellent job, well done! I totally like the “do nothing from Wednesday to Saturday” part. Will follow suit. See ya “la bas”. See you in St. Tropez. I can taste the gelato already! Super results. 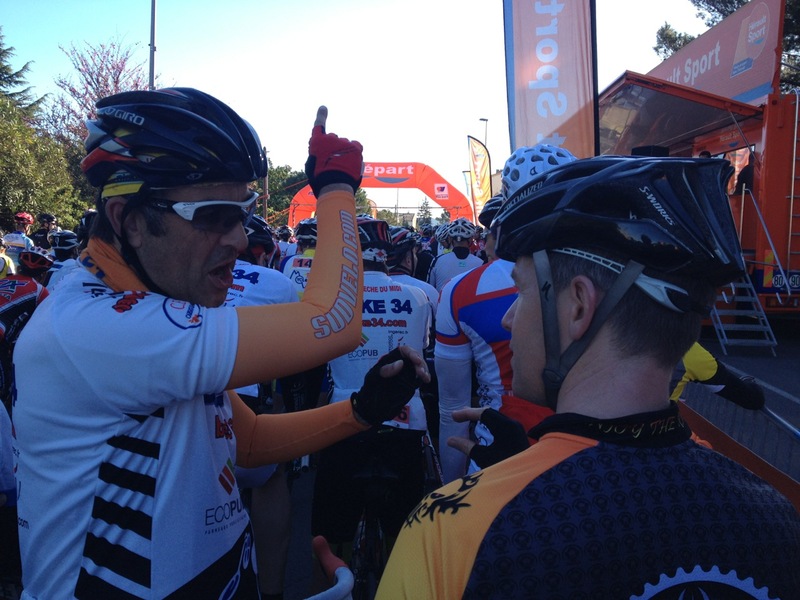 Good to hear you were with a bunch of smart riders … here, the stronger, the faster, a rider is, the higher the odds are that they are more skilled and much more likely to ride “smart.” It may come with experience. The most rude, dangerous “stupid” riders I’ve seen in groups are usually pretty new at it. Like usual, please tell Anne chapeau for me, it isn’t usually the very most fun in the whole world to be one of a tiny group of women. Anne is very strong this year and is used to riding with a bunch of men. She has no choice…it’s all she has for training partners! Training partners .. men are the very best. But they aren’t competition in my (or Anne’s) category in races, so it can become limited, or at least a different kind of experience. The Belgian guy actually commented on it approvingly. Yet another reason I like Belgians so much right now. Nice job on the ride. Your post brings out a good question. What is the proper etiquette for ‘not’ doing a pull at the front? Ideally you should take the lead but sometimes for a variety of reasons one doesn’t. Yesterday’s club ride, first since October, had our former Tour de France female rider lead for virtually the whole ride. We were 2 aside in a group of nine but the one position was relieved regularly while she only needed a short break. When I finally volunteered, I kept asking her questions in the hope it would slow her down. It didn’t. The next strategy was praying for hill because they know I go out the back end. So what is the etiquette when it’s your turn and you don’t or can’t go? when it’s your turn in a pace line and you CAN’T take a pull, you tell them.. I’m spent.. sitting in now..and you sit on the back and make sure you don’t get in the way of the rider who just took a pull from getting back on. If you just Won’t take a pull..it’s 1 of 2 things..either you’re just a jerk or you’re in a race and it’s strategy coming to the line. Thats just my opinion after many years of racing. I looked back a few times during the ‘race’ and the front 6 or 7 guys had min 20 behind who never bothered to come up. Everyone has their own reasons, I guess, but even if they told me them I doubt I’d understand.